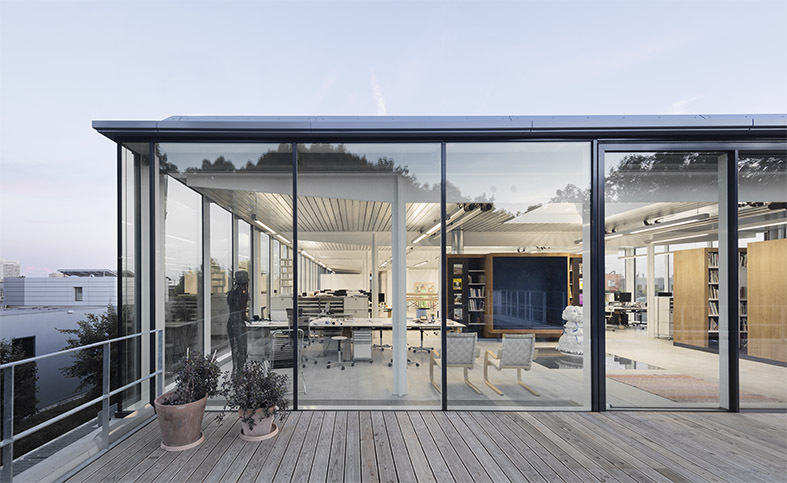 With the addition of a storey to the Lindbergh studio in the Freimanner Hölzel district, the concept of a studio enterprise will be redefined and interpreted through the spatial arrangement. At the same time, the restructuring of work areas is a response to the continued development of working methods since the building was completed in 2002. The design department work areas are located on the new floor, so that the specific requirements of creative work receive special consideration there. The exhibition of selected works of art represents an additional spatial component. Light-flooded and open work areas have been created that promote interpersonal exchange and communication. By contrast, work cubicles enable concentrated, intensive work sessions. A restructuring of work areas also took place on the existing first floor in the course of the building activities. By design, the concrete structure of the existing building was not pursued, but expanded with a steel structure.